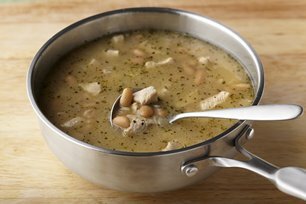 Serve up a hearty dish with our Easy Chicken Soup Recipe. This Easy Chicken Soup Recipe is a chunky, delicious soup that is quick and easy to prepare. Heat oil in large saucepan on medium-high heat. Add chicken and onion; cook and stir 8 min. or until chicken is cooked through. Stir in flour. Add beans, broth and dressing mix; mix well. Bring to boil. Reduce heat to low; cover. Simmer 20 min., stirring occasionally. Look for firm onions with smooth skins. Avoid onions that are spongy, or those that have sprouting bulbs or dark spots. Store onions in a cool dry well-ventilated place for 3 to 4 weeks. If you use only part of an onion, store remaining portion in a tightly covered container in the refrigerator and use within 4 days. Cannellini beans are also known as white kidney beans.